The following 3 users say Thank You to achlon for this useful post. The USD / CHF pair is beginning to rebound after testing the 0.9750 level in the past sessions and attempts are underway to break the 0.9723 level, which supports the continuation of the bearish outlook for the coming sessions, awaiting the direction towards 0.9620 which is our next major stop. On the other hand, keep in mind that a break of 0.9750 will push the price to test the 0.9850 areas before any new attempt to decline. The pair managed to break the 0.9723 level and settled below it, reinforcing expectations of a bearish trend over the short and short term, opening the way towards the next target at 0.9620. Therefore, we will continue to bias the bearishness during the coming period unless the level of 0.9750 is breached and stability above it. The following 9 users say Thank You to amine ff for this useful post. 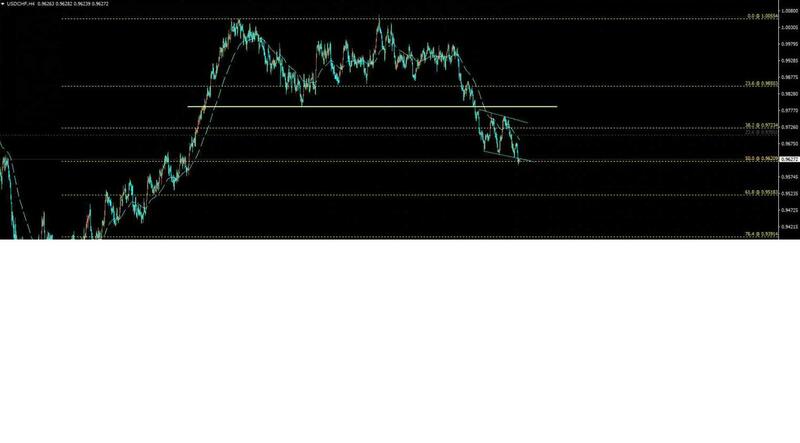 The USD / CHF pair has been trading with a remarkable bearishness since yesterday, approaching the awaited target at 0.9620, which represents the 50% Fibonacci retracement of the rally from 0.9186 to 1.0055, which means that breaking this level will push the price towards 0.9518 directly. SMA 50 is a continuous negative pressure against the pair to support the continuation of the bearish trend during the coming period, noting that a breach of 0.9723 - 0.9740 will stop the expected decline and lead the price to rise again. The following 10 users say Thank You to amine ff for this useful post. USD / CHF is nearing our main target at 0.9620. Stochastic is clearly losing its positive momentum to enter overbought areas, while SMA 50 is a continuous negative pressure against the price. Therefore, these factors encourage us to hold the bearish trend in the coming sessions, noting that a break of 0.9620 will push the price towards 0.9518, while breaching 0.9723 and then 0.9790 will stop the expected decline and push the price to start attempts to recover in the short term. The following 7 users say Thank You to amine ff for this useful post. The USDCHF succeeded in touching the awaited target at 0.9620, settling around it, and is under negative pressure coming from SMA 50, which represents an opportunity to break the mentioned level and then open the way for the downside wave to extend towards 0.9518. Therefore, we will continue to bias the bearishness for today unless the level of 0.9723 is breached and stability above it. The USD / CHF pair has been showing some bullishness since yesterday to move above 0.9620, but the SMA 50 continues to press the pair negatively, accompanied by stochastic access to overbought areas. Therefore, these factors encourage us to hold onto our downside expectations, noting that the next target is 0.9518, while stability below 0.9723 is an important condition for the continuation of the suggested decline. The following 6 users say Thank You to amine ff for this useful post. USD / CHF extended more positive trading to test the 0.9700 barrier and rebound from there, supported by the negativity of the current stochastic, waiting for the resumption of the downside move which depends on stability below 0.9723, which starts with the break of 0.9620 to confirm the extension of the downside wave towards 0.9518 which represents the level Fibonacci retracement of 61.8% for the measured height from 0.9186 to 1.0055. The USDJPY broke the 0.9620 level and stabilized below it, which supports our continued bearish outlook for the coming sessions, opening the way towards our awaited target at 0.9518, supported by negative pressure formed by SMA 50. We note that the continuation of the expected decline for today depends on stability below 0.9620. The USD / CHF pair is showing some bullish bias now approaching the pivotal resistance 0.9620, accompanied by Stochastic reaching overbought areas, while SMA 50 continues to pressure the pair negatively. Therefore, the bearish trend will remain likely in the coming sessions unless the 0.9620 level is breached and stability above it, with the reminder that our next main target resides at 0.9518.